The Ooze let me reprint an article I wrote for their December newsletter. For some people, the Advent season on the church calendar is one of the most anticipated times of the year. For some, there is no other time in which their love of God is stronger, there is no other time in which they are more aware of God’s mercy in their lives and in the world, there is no other time in which their hearts go out to others with such affection, and there is no other time in which their joy is more profound. For me this time of year has always been a spiritually dry time. There is a line in a Counting Crows song that says “You can see a million miles tonight, but you can’t get very far.” That is my experience during this season. Every year I anticipate it with everyone else, hoping that this year will be different. Maybe this year the earth shattering experience of God will take place, and I’ll be able to take in the seismic joy that should result from the knowledge that God entered the course of human history to reclaim it as his own. But by December 26th, I’m left with disappointment, another year of not getting very far. I think my personal division reflects a broader cultural division. I’m willing to suspend my cultural cynicism for a moment and speculate that at the root of American consumer Christmas is a deep seated desire for meaning. I may be way off on this, but I suspect the decorations, the music, the saturated social calendars, the capitalistic flurry, and the caloric overload are attempts at finding something true, something significant. Hopes for discovering community and transcendence. There is a neighborhood near my own that puts on an unbelievable show of lights, music, and decorations for the weeks leading up to Christmas. Cars line up for blocks to meander through the illuminated streets and residents sit in their driveways around firepits and chat with the passersby. Aside from laying a carbon footprint likely visible from outer space, it is a powerful display of community spirit. The problem, I think, is that our culture doesn’t know how to truly celebrate. Overconsumption and overstimulation are the only ways we know how to mark a special occasion. Even though most of implicitly know it doesn’t work and that we’re going to wake up with a hangover, it’s all we know how to do. When there is a significant event, we commemorate it by scurrying around, spending absurd amounts of money, gathering a crowd, and turning up the volume. If we’re not weighed down by anxiety and insomnia, then it must not be a very important occasion. Our holiday “celebrations” therefore seem destined to only get bigger and bigger, because we have built up such a tolerance. Then we rush home, hustle the kids into bed so we can finish wrapping gifts and stuffing stockings, because they’ll be up in 5 hours. Sleep in heavenly peace indeed. I was asked to write about this topic because I just published a book about Christian introverts, those in the church who prefer a quieter, slower, more contemplative lifestyle and who, for those reasons, often find themselves on the fringes both of the culture and of Christian community. I saw a blog post recently that called January 2nd “Happy Introverts Day” because of the notorious nature of the holiday season for those of us who find social interaction tiring and sometimes stressful. But the truth is that the need for a quieter, less cluttered, more reflective Advent season is not restricted to introverts. The clatter of the holidays has caused people of all temperaments to turn from the inner places of our souls, contributing to the superficiality of our spiritual practice during this season. We need to find a new way to celebrate. In the early centuries of the Church, celebrating Christmas was a counter-cultural activity. It’s unclear whether the church fathers chose December 25th to co-opt the already entrenched pagan festival of the Unconquered Sun, or whether the pagan holiday was established to rival the Church’s celebration of the birth of Christ. What is clear is that Christmas was a subversive event, providing an alternative to the mainstream culture’s celebration. In our world, quiet is counter-cultural. I’m not only referring to quiet on the outside, but also quiet on the inside. In fact, it may be easier to shut out the external voices than it is to silence the internal noise. It’s often those inner voices, especially the unacknowledged ones, that compel us to fill our lives with movement and agendas and spending and eating. Our behaviors and hurry are echoes of our inner doubts about our worth. Sadly, in many ways the nature of our holiday celebrations reveal how incompletely we have embraced the actual message of Christmas. In contrast to the dizzying nature of our cultural celebrations, the biblical narratives about Jesus’ birth speak in hushed tones about simple, unsophisticated scenes. The baby of prophecy, the King of kings, is born in a quiet town in an inconsequential region to unremarkable people and placed in a trough in a barn. Yet by the grace of God this spot becomes the center of the universe, the matrix of hope and redemption and salvation. The quiet, ordinary place becomes the beginning of the dramatic climax of the great Story. The birth of Jesus incarnates the promise that we are not alone and that we are loved beyond measure, recipients of a love that brings peace and stillness to our souls. The birth of a child is both a time of poignant gratitude and a time of quiet anticipation. I remember how friends of mine described the day they brought their first child home from the hospital. They placed him in his crib, in the room they had been preparing for months, and watched him sleep. For hours they sat in contented silence. My friend said “It was unlike any other moment in my life. It was the greatest moment of love we’d ever experienced, more intimate than even our wedding night. There was nothing else in the world we needed that day - we had everything.” Yet he also said that as he looked into his son’s eyes, he was full of anticipation. Who will my son be? What will he do in his life? Who will he marry? What will be his gifts, his calling? Like Mary the mother of Jesus, my friends stored up these things in their hearts and silently wondered who their child would become. Advent is not only a season of reflection on events past. It is a season of quiet hope, as we await the second advent of our Lord Jesus, who will come and complete his reclamation project. Our celebration during this time of year is necessarily incomplete. In this season we must prepare small, quiet places in our individual souls and in our communities, still longing and waiting for the fulfillment of Jesus’ work and the rebirth of creation. I’m still struggling with Advent, still reaching for something that I haven’t found yet. I do know that if there is any chance for deep experiences of God’s grace and love in this season, we need to open spaces for hope and attentiveness in our hearts. 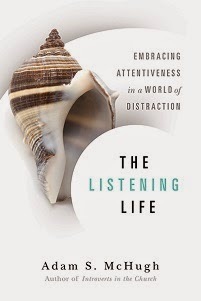 We can’t compel God to move, but we can clear away what distracts us from hearing his gentle voice. We can reduce the external clutter of the season by simplifying our celebration. We can slowly savor the biblical prophecies of the coming of the Messiah and the narratives about Jesus’ birth. We can devote time to silence and solitude as well as to corporate celebration. We can learn to say “no” when we find ourselves spinning from all the invitations and seasonal stimuli. We can listen to the voices of people who are not often heard over the cultural shouting – the poor, the hungry, the suffering around the world. We can prepare a quiet place for God to renew his love and rebirth his hope in us. 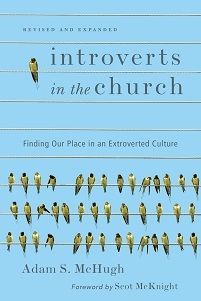 Adam McHugh is an ordained Presbyterian minister and the author of the newly published Introverts in the Church: Finding Our Place in an Extroverted Culture (IVP Books, 2009).